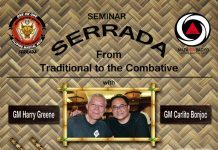 This past weekend (January 28, 2009) I had the honor of of attending one of the best martial arts seminars I have attended. Sensei Ed Sumner of the Reno, Nevada Jundokan brought in his instructor, Sensei Teruo Chinen for a two day seminar. We had the absolute pleasure of working out at BattleBorn Jujitsu in Reno, Nevada where Sensei Sumner teaches and this dojo, owned by Mike Zerr and Eric Cox, is beautifully equipped and very well maintained. First, I would like to tell you a little about Sensei Ed Sumner. I had the pleasure of partnering with Sensei Sumner and he is truly a gentlemen, patient and an excellent instructor. He trains hard and has endured his share of training injuries and yet he moves with agility and never complains. He is now my shining example of a karate-ka who deals graciously with injuries and continues to train hard. I will have to train harder. Sensei Sumner began his training at age 17 in Judo while he served at Goodfellow Air Force Base in San Angelo Texas. A fellow judo student who had trained in Okinawa introduced Ed to karate. Once assigned to Asia, Ed immersed himself in karate, receiving a black belt from the Cross Winds Dojo in the Philippines, and in Goju Ryu from Katsuyoshi Kanei (deceased) of the Jinbukan Dojo in Okinawa. When he returned to the states, Ed continued his training under Sensei Teruo Chinen of the Jundokan International, based in Spokane Washington. With his Sempai, Jim Botsford, Ed also served as the Base karate Instructor during his 18 month tour of duty at Tan Son Nhut Airbase in Vietnam from 1967 to 1969. Now to Sensei Teruo Chinen. I have to say that Sensei Chinen is an unassuming figure whose unique power draws your respect immediately. I don’t know how to explain it but to say that he is true Okinawan Karate-ka, not what most of us are use to here in America. Sensei Chinen began his Goju Ryu karate training as a young child under Chojun Miyagi, Sensei and upon the death of Chojun Miyagi, Sensei, Chinen continued his training under Ei’ichi Miyazato. In 1969 Sensei Chinen moved to the United States and began teaching Okinawan Goju Ryu in Spokane, Washington. Lucky for us he did. Teruo Chinen is not only a superb martial arts instructor, but a martial historian as well and he intertwined the history of traditional Okinawan karate as we trained. He shared with us the old “tales” of the famous warrior of the ming dynasty who is shown on the Junokan International patch. 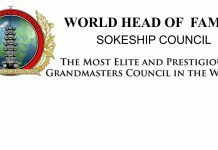 A most excellent instructor, he kept a careful eye on his students and varied his teaching with the perfect compliment of physical training and historical teaching. We had the honor of sharing in his knowledge as he sat us down and took up pencil and easel and gave us a brief history of Okinawa and the region around the Islands and the karate that grew up there. Sensei Teruo Chinen has a wonderful sense of humor and allowed us to ask numerous questions, sharing with us his knowledge of what it was really like to train as a child and teen in Okinawan dojos. I was fascinated to learn that he trained for years learning techniques before he ever began learning kata. 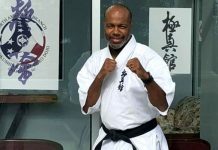 When he began learning the kata, he discovered that he already knew the moves as the kata was made up of the techniques he had learned. Thus, Chinen understood the bunkai-oyo for the kata and was not just mimicking a series of moves. 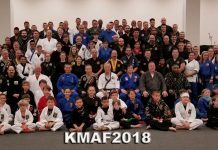 In many American dojos we learn in the opposite manner, we learn the kata and then attempt to find the techniques hidden within it and it is often difficult for us to see the fight in the kata. He also shared with us that it was a misnomer that one must turn away from the instructor to straighten ones gi. This was not a practice in any of the dojos he trained in and is not a practice in his dojo today. 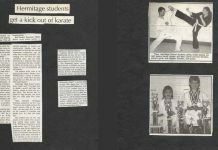 Sensei Teruo Chinen has a strong belief in good solid conditioning and this led to a very good physical workout, but also to stories and lessons about his karate training and about the tools he grew up using and which he still uses in his dojo today. He told us about the Chiishi (chashi) which is a flat bottomed circular stone or concrete weight with a straight handle (typically 5 to 15 pounds) which was originally used as an Okinawan tool for packing soil. We talked about the Makiwara, or striking post. Most of us have used a Makiwara at one time or another with rope wrapped around it. He explained that they used rope because they did not have leather or any other type of material to use, not because it had some intrinsic training value. He told us about the To that was used before the punching bag was created. The To was a post sunk in the ground covered with thick bamboo and then with leather. Sensei told us that they used a tool covered with bendable reeds made to practice nukite (finger tip strike). We learned about the Ishi-sashi or stone padlocks (used kind of like a dumbbell) and the Kongo Ken or Iron Diamond which has the same structure as a man’s body and is used to develop grappling and throwing skills. Another tool, the Nigiri Game or gripping jars helps strengthen your grip but also strengthens feet, legs, hips shoulders and forearms. The jars were filled to become heavier as the karate-ka developed more strength, better balance and posture. Strengthening exercise for Karate, Hojo Undo, performed by Goju-ryu practitioners in a demonstration in Okinawa. Visit http://www.karatebyjesse.com for more info, videos and the blog! Sensei Chinen is in superb condition, even though he is in his sixties, and I could not take my eyes off him as he demonstrated techniques and kata. Every move perfect, his entire body muscled and yet fluid a true combination of the hard, soft of Goju Ryu. The kumite done with such skill and every move accurate. Throughout the seminar I could see In Sensei Chinen’s moves, that he was hitting just the points he wanted to hit and preparing his opponent for just the strikes he intended. By the middle of the day I was exhausted as much from trying to absorb everything I was seeing, hearing and attempting to understand as from the workout itself. It changed my life as I began to truly understand karate and my own need to stay conditioned, to eat right, get the rest I need and to change my thinking regarding my training. Returning home, I laid in bed exhausted, thinking about what I had learned. 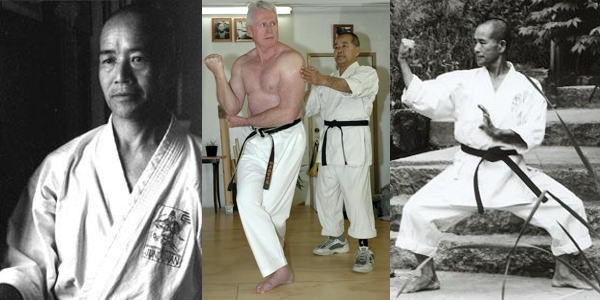 I had been spurred on by these two teachers, Sensei Teruo Chinen and Sensei Ed Sumner, to get in better shape and to think more about the abilities I have, rather than the disabilities that hold me back. I want to travel to the Jundokan in Spokane, Washington and to sit at Sensei Chinen’s feet and just listen to him share a lifetime of karate. I want to visit often and train more with Sensei Chinen and I pray that Sensei Sumner and the Reno Jundokan will bring Sensei Chinen back to us much more often. If you get a chance to train with Sensei Chinen or with Sensei Sumner, please do not pass up the opportunity! Dana Stamos owns Martial Arts Enterprises and operates numerous martial arts websites including USAdojo.com, MartialArtsEntertainment.com, FightCon.com and the MartialArtsSchoolsDirectory.com to name a few. 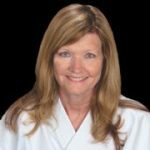 She loves martial arts and believes that the study of martial arts will make a difference in the lives of individuals and families.